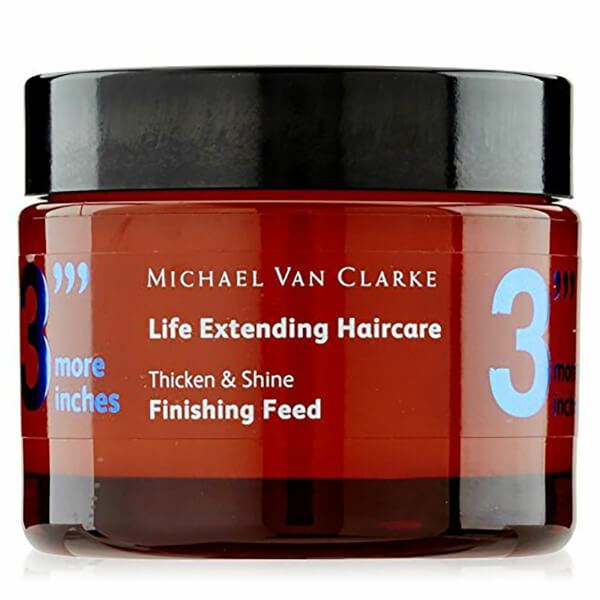 Created to soften, nourish and de-frizz the hair, the 3 More Inches Thicken and Shine - Finishing Feed is a wax like balm perfect for all hair types. Working to seal the hair with intense moisture, it contains coconut oil, aloe and cashmere proteins which combine together to give the hair a salon perfect finish. K.D. Ricinus Communis Seed Oil (Ricinus Communis (Castor) Seed Oil), Cera Microcristallina (Microcrystalline Wax), Hydrogenated Castor Oil, VP/VA Copolymer, Alcohol Denat., Cera Alba (Beeswax), VP/Eicosene Copolymer, C12-15 Alkyl Lactate, Olea Europaea (Olive) Oil Unsaponifiables, Alcohol, Parfum (Fragrance), Limonene, BHT, Hydrolysed Keratin, Alpha-Isomethyl Ionone, Linalool, Geraniol.